Can you all weigh in on the Rocksport shocks? Travel, Ride, quality....how do they compare to the fox and OME shocks available for the game changer. Thanks in advance. I have no experience with Rocksports, but OME shocks on my dad's jeep ride great. Fox's are rebuildable and tunable, but their length can be problematic (very long shock, req. more bumpstop). We are about to install the rocksports and they seem like a beefy shock. They seem to be of good quality. I run them. Have not had OME or Fox so I can't compare. Only other shock I've run would be the Rancho 9000 adjustable series and these are comparable. The 9000 are a great shock so that is a great comparison. Curious on travel. Also would like to hear MC chime in. Fronts are 15.9" - 27.3"
Rears are 16.8" - 27.8"
-31 front 16.66" - 27.3"
-32 rear 16.81" - 27.25"
Thanks Jim. Looks to be some extra travel. How bout some comparison to the 6-Pak shocks? Do they blow the Rocksports out of the water?? We have the Rocksport shocks with our 3.5 MC game changer and love them. They have great travel and ride quality. They out do our friends fox shocks every time! When we bought our lift we were going to go with OME but MC phased out the OME shocks in favor of the Rocksport. They have done us good so far. Been running them for 2 years and I am very happy with them and the Metalcloak Gamechanger suspension. Take a look at this link. Gives a good illustration of the travel the shocks provide. I upgraded my pro comp budget lift with the MC Game Changer 3.5". I wanted the fox shock edition but the only installer suggested the rock sport. He said they are a good shock and you get a little more travel with them vs the fox. I didn't know what to think about this information because why would he try and sell me a less expensive product. I figured why not it would save me a few bucks and get me out of the @#$% lift I had on my JKU. Well, 10K miles later and a lot of wheeling and he was right. The shocks are great both on and offroad. I would recommend them. Awesome to hear. Have you had a chance to get it on the CTI Trailer or a ramp to flex it out? I also have a MC Game Changer 3.5" with the Rock Sport shocks. I like them a lot. I haven't tried any other shocks on this rig but have rode in other JKUs with different brands. Fox is very popular but if its not the BDS version they seem to ride really rough. However, I think coils make a bigger difference in your ride than the shocks do. Stock Rubicon shocks vs. Rocksports. 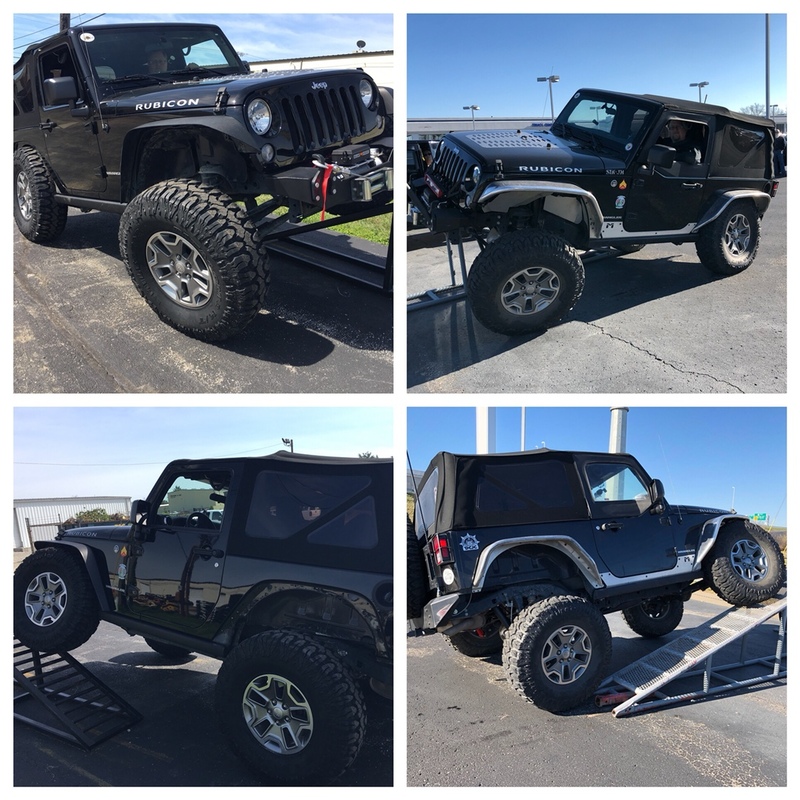 Before and after RTI ramp pics. About 200 points higher score with the increased travel of the Rocksports. I only have about an inch of lift all around (JKU coils and small spacers). 2” Bumpstop in the front and 3” in the rear which is what I need to keep the shocks from compressing too far. My build is based on lots of droop, little up travel currently. Ride quality improved a little with the Rocksports, rear end isn’t as bouncy as it was. Stock Rubicon shocks vs. Rocksports. Before and after RTI ramp pics. About 200 points higher score with the increased travel of the Rocksports. I only have about an inch of lift all around (JKU coils and small spacers). 2&#8221; Bumpstop in the front and 3&#8221; in the rear which is what I need to keep the shocks from compressing too far. My build is based on lots of droop, little up travel currently. Ride quality improved a little with the Rocksports, rear end isn&#8217;t as bouncy as it was. That is an awesome photo showing how much more travel they have. Thanks for the pictures. Do you have any trouble with the springs coming out? At that max RTI, the rear coil unseated, so I may add 1.5” coils and/or limiting straps.